I broke my posting streak when I missed out on yesterday but before that I had a 12 day run which is definitely a record for me. 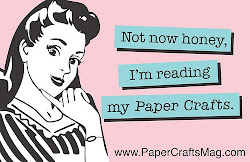 I got a little time in the Craft Cave this afternoon and have two cards to share for three challenges. 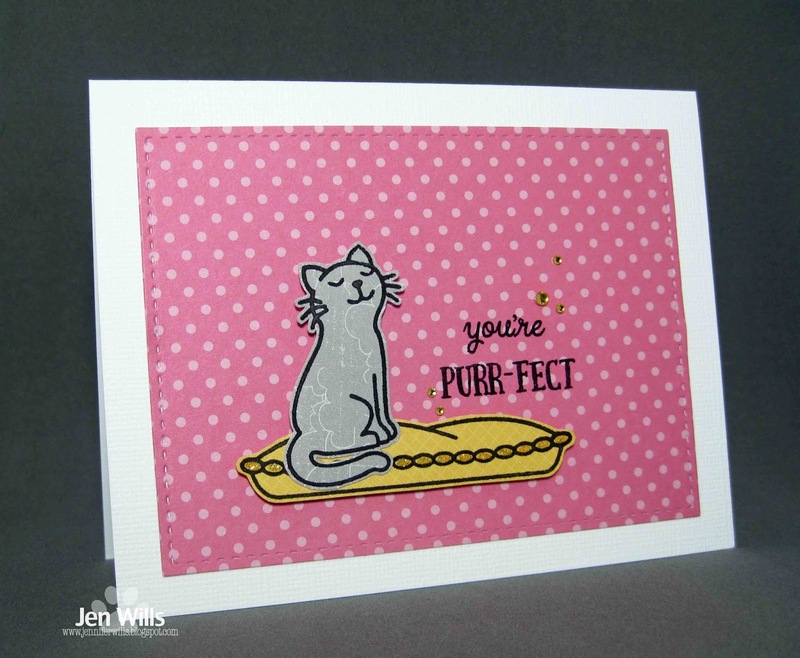 First up is my card for the current Muse challenge. I stuck very close to Tracey's card in terms of colour and matting and also using a swirly stem for the flowers. I used dusted off some DCWV cardstock for this one and I had forgotten how much I love the texture of it. I also pulled out some old Hero Arts flourishes to use for the stem. Someone used these recently and I commented that it was one of the earliest stamp sets that I bought. Can't remember who it was but thank you for reminding me to look for the set! Next is a card inspired by the photo at Curtain Call. (I like the little kitty cat cap in the top right corner). I paper pieced some NBUS Avery Elle stamps and popped them up on a bright background. Sweet and simple! 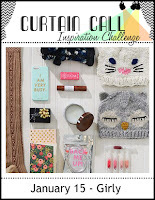 I'm also going to enter it in the Create with Critters challenge over at the Simon Says Wednesday Challenge. That's it for tonight. Dinner is almost ready - Luis is cooking for us! Whoop whoop! 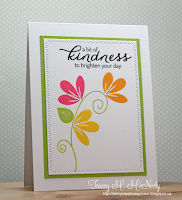 Your flowers and swirly stems are a perfect take on Tracey's card. (Now, the important stuff.) Look at the expression on that cat! Awesome. This is an adorable card. Love them both Jen! The flowers are so pretty and that kitty too sweet!! Your Muse is gorgeous Jen, I love the swirly stems and those retro daisies! Your Curtain Call is purrfectly fun too! Thank you so much for sharing with us at Muse this week! Great take on the MUSE card Jen! It's good to go back and find that stuff that needs to be used, isn't it? 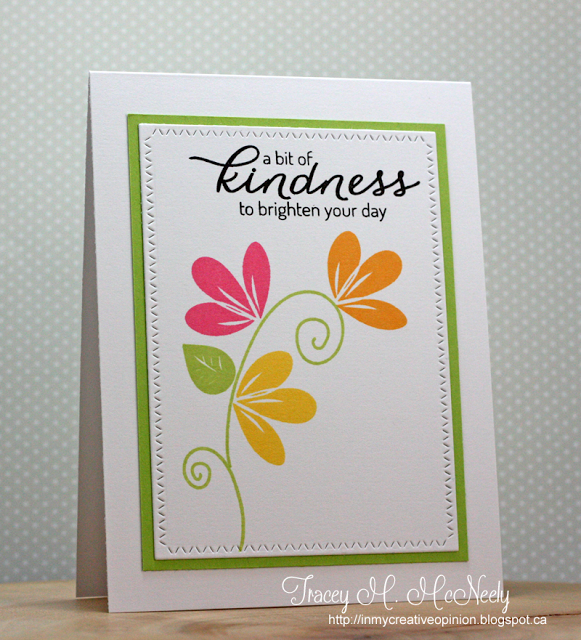 Love the energy in your card and the rich colours! So glad you joined us at Muse this week! 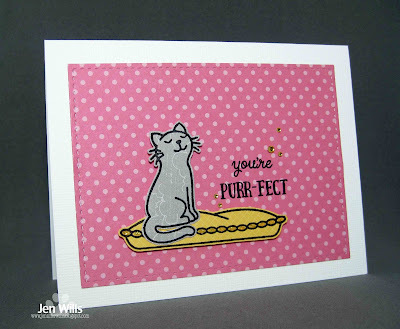 swooning over your MUSE card...and your adorable girly card...so sweet. So happy to have you playing with us at Curtain Call. 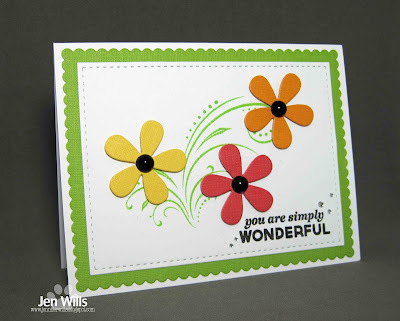 Love your Muse card ... the swirly stems are a plus ... perfect. These are both wonderful, Jen! That flourish makes a perfect stem for your colorful flowers, Jen, and the kitty is so cute on that bright background. Smiling in seeing your pretty spring blooms, Jen, and the well-poised kitty is darling! Perfect, indeed!